Toward the end of World War II, the Allied forces bombed the town of Darmstadt, Germany. In 1945, those sorting through the rubble found some old musical scores and set them aside to be reviewed by a musicologist. 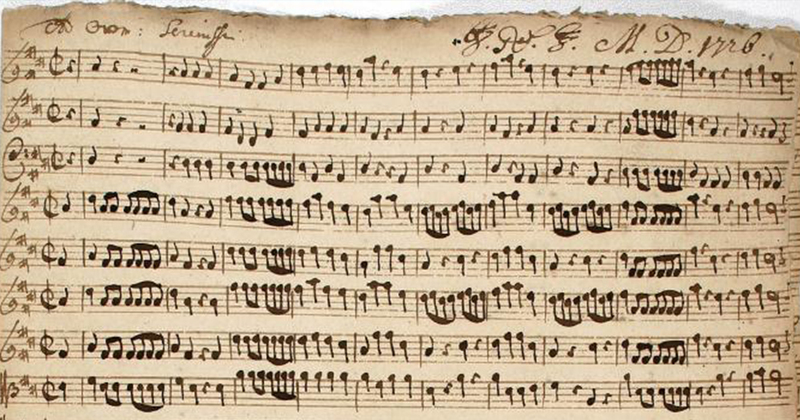 The scores turned out to be several works by a Lutheran cantor from Darmstadt named Christoph Graupner (1683–1760), who lived at the same time as J.S. Bach (1685–1750) and George Philipp Telemann (1681–1767). Not only were Graupner, Bach and Telemann contemporaries of one another, their musical and professional paths followed similar courses, intersecting notably in 1722. That year, Telemann was offered the position of cantor at St. Thomas Church in Leipzig but turned it down. The position was next offered to Graupner, who also declined it, at which point Leipzig City Councilman Abraham Christoph Plaz reportedly said, “Since we cannot get the best, then we will have to settle for average.” The post was then offered to Bach, the third candidate in line, who accepted. His family did not abide by that wish, but legal wrangling over ownership of the works kept them out of circulation for close to a century. By the time the ownership question was settled, musical tastes had changed, and the liturgical use of art music had declined. As a result, Graupner’s works remained in relative obscurity. The performance begins at 3:00, with a pre-concert lecture by Dr. Bruce Carvell, director of the Vocale, beginning at 2:30. The Collegium Vocale is an ensemble devoted to presenting performances of 17th- and 18th-century music in a manner in which it might have originally been performed, using an historically informed approach to instrumentation and performance. The four cantatas are newly edited from Graupner’s manuscripts especially for this concert, and this performance will be the American premiere of these works. The six vocalists of the Collegium Vocale will be accompanied by an ensemble of musicians playing instruments of the period or modern replicas, including recorder, violin, viola, cello, trumpet, bassoon and organ. Admission to the concert is free, with a suggested donation of $10. For more information, visit collegiumvocaleofsaintlouis.org.